As I type this I'm doing a few walking warm up laps. 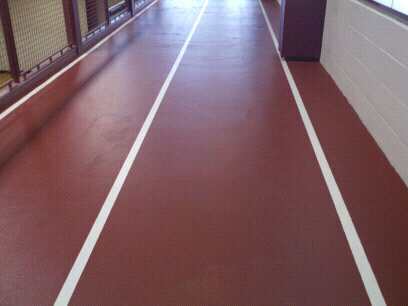 Track or treadmill? I think track as I won't be getting my new sneakers until tomorrow.... and the treadmill can be so boring. I'm going to time my run and see how fast I can do one mile. I'll post my results later. Update: 9 1/2 minute mile. thanks for the info on the watch w/ interval beeps, sonya. i will probably go buy a timex ironman this weekend. i think they are on sale at penneys (or they were a week or so ago). i'd like a fancier one, too, but for now i just need the beeps. when i'm on the treadmill i listen to music so not sure i'd hear it. outside i don't use music because i want to be aware of/enjoy my environment. i can always ask for a fancy watch for christmas if i feel i need it. i do plan to make running a habit, but not sure i'll ever advance past 5K. but never say never, huh? i'm 59 years old and headed toward 60, so i'm testing my capacities for now. Linda there is another.watch I've seen online - Jeff Galloways website? It's a watch that also vibrates. I can hear my watch beep even though I listen to my ipod when outside - I have the volume on low.